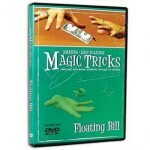 Everything you need to know to make a dollar bill float is included on this instructional DVD! Easy to learn routines! Gimmicks included. Collect the series!Invisible Thread & Wax Included!